We recently took at trip to Thirukkurungudi, a temple town approximately 40 kms from Tirunelveli, in the region historically known as Nellai. The temple is famous for its reenactment of kaisika EkAdashI nAtaka. 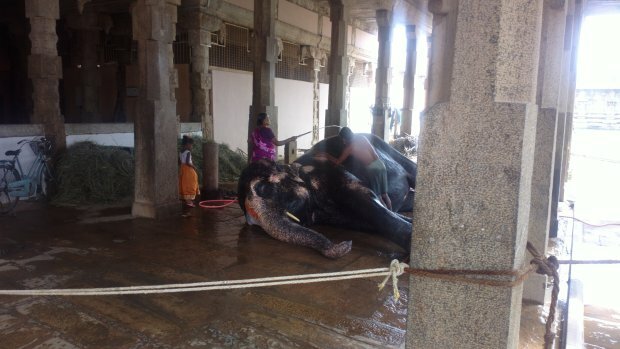 Our eyes caught the temple elephant which was chained and tortured. It brought a tear to our eyes. Please check out our pictorial. I prefer the heat in the afternoon. No cold water. The poor mammoth was being bathed with cold water in the warm afternoon unnecessarily bringing some relief from the heat. The cruel mahouts didn’t care to ask for the elephant’s permission to bathe it. What brutality! I beg you please stop. The inhuman folks continue without an ounce of compassion despite the behemoth begging them to stop. If this isn’t savagery, we don’t know what is. The poor thing ultimately gave up like a common slave does. We hope someone files a FIR with the AWBI and contacts Maneka Gandhi immediately. The speciesist mahouts decorate the elephant with pagan symbols. Did they check if the ink was toxic? Did they check if it was manufactured cruelty-free? Is the decorative garb not made of mink or fur? Did the elephant ask them for this decoration? The elephant lets out a cry asking us to save it. Heart rending. If there is a God in this temple why does he/she sustain this abomination? The evil pagan authorities hardly feed the elephant. The poor thing is so weak & malnourished. Just 60-70 kilos of hay. How will it suffice? They don’t even remove my excrements! Look at how they keep the elephant dung close to the pachyderm. It can lead to all sorts of disease. Nearly 15-20 kilos of dung. Will a healthy well-fed elephant dump so little? We hope all authorities (PETA, AWBI, Greenpeace) with an ounce of humanity to immediately put an end to this evil practice. Share it with your friends & the relevant authorities. The article originally appeared at https://whitericevellasamy.wordpress.com and is written by @KarikadaiBoy and has been reproduced here in public interest with author’s permission. Here is the link to the original article.